Although there are many types of lice, the head louse, or Pediculus humanus capitis, is a parasitic insect that can be found on the head of people. Head lice (the plural form of louse) feed on human blood several times a day and live close to the scalp to maintain their body temperature. 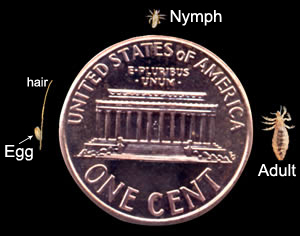 Head lice come in three stages: egg, nymph and adult. Eggs are often called lice nits, although many people refer to nits as the empty egg shells left behind by a hatched louse. A head-lice infestation occurs when a female adult louse makes it onto a new head and lays eggs. 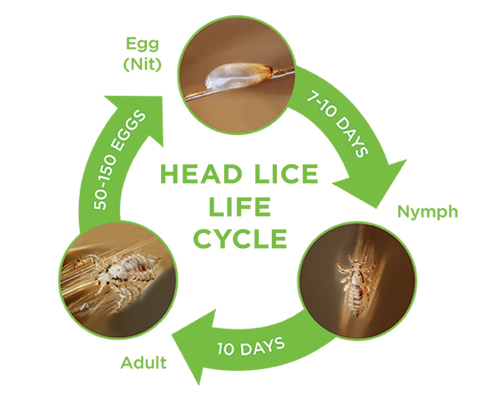 When those eggs hatch, the lice will most likely stay on that head throughout the entire lice life cycle. Unless the head is treated and all lice and eggs are eradicated, the lice infestation will continue. Fresh Heads Head Lice Removal Treatment Center will quickly and effectively remove all head lice infestations. 1: A Fresh Heads technician will thoroughly check your hair. If evidence of lice is found we will help you choose a treatment option best suited for you. 2: Depending on the option you choose you’ll spend 1 to 3 hours at Fresh Heads being treated by our kind and professional staff. Our Signature AirAllé device is used to gently blow heated air through your hair to kill all lice and nits. During our traditional comb out our technicians will go through your hair strand by strand to remove lice and nits. 3: Once every member of the household has been checked for head lice and treated (if needed), we will share essential house cleaning information. 4: We will also show you how to prevent future head lice outbreaks and give you the opportunity to sign up for our Fresh Heads Lifetime Protection Plan. Head lice are parasitic insects found on the human head. They come in three forms: the egg (nit), the nymph, and the adult. Nits are laid at the base of the hair shaft. Incubated by the warmth of the human head, the nits hatch in eight or nine days when they are located within a quarter of an inch from the base of the hair shaft. Nymphs are the immature lice that hatch from the nits. The nymph matures in about nine to 12 days. The adult female is able to lay between 8-12 eggs every day. Lice eggs are dark in color, oval shaped, extremely small, and hard to see. Sometimes they appear to be the same color as the hair. The nymph is similar in appearance to an adult but is much smaller. An adult head louse has six legs, a tan to grayish-white color, and is about the size of a sesame seed. Where are head lice usually found? The lice are found anywhere on the human scalp. Nits are found cemented to the hair shaft and are laid very close to the scalp. The head lice crawl along the hair shaft with hook-like claws at the ends of their six legs. After the lice lay eggs, they cover them with glue that is chemically similar to cement. This glue firmly attaches the nits to the hair shaft and provides a protective coating that is extremely difficult to remove. Are head lice a human health threat? No, head lice are not known to spread disease. However, itching leads to scratching, which when excessive, can create openings in the skin that may become infected. Head lice are highly contagious. Mothers have a 90% chance of contracting head lice from their children. Siblings have an 80% chance, caregivers have a 35% chance, and dads have a 20% chance of contracting head lice from an infested child. Anyone, anywhere can get head lice. Most commonly, head lice infestations affect preschoolers, elementary schoolchildren, and the families and caregivers of the affected children. According to the Centers for Disease Control and Prevention, the United States has six million to 12 million infestations among children three to 11 years old each year. A tickling feeling of something moving on the head, itching (caused by an allergic reaction to the bites of the head louse), irritability or sleeplessness (head lice are most active in the dark), and head sores caused by scratching are the most prevalent symptoms. Head lice infestations can be asymptomatic, however, especially if it is the first or a light infestation. Only 50% of those who have head lice are actually itchy because of lice bites. How do head lice spread from person to person? Head lice spread when there is direct head-to-head contact with someone who is infested. This could take place during otherwise innocent occasions (children playing at school, at home, at slumber parties, at camp, and during sports activities) or actions (hugging). Anyone at anytime who comes in head-to-head contact with a person who has head lice is at the greatest risk. Can head lice spread by coming in contact with clothing or objects? Head lice must feed on human blood in order to survive. An adult head louse will die within 24 to 48 hours of being off a human head. Nymphs can only live for several hours without feeding. Nits must be kept warm by the scalp, and are therefore not viable when off of a human head. For all of these reasons, it is not very likely that lice will spread by way of inanimate objects. However, it is not impossible, and therefore basic cleaning of bedding, carpets, upholstered furniture, hairbrushes, stuffed animals, hair ties, and clothing should be done whenever head lice is found in the home. How do schools handle head lice cases? Every public school in Florida and Georgia currently has a ‘no nit policy’. There is evidence that head lice spreads more commonly through close friends who engage in afterschool activities and playtimes, and less commonly through the more casual contact that occurs in the school setting. Still, most schools will take reasonable effort to provide classroom and sibling head checks when there is a known head lice infestation. How effective are pesticides in treating head lice cases? Pesticides are not only ineffective, they are also very dangerous and do more harm than good. A family of four spends an average of $800 on pesticide-type lice shampoo products that don’t work. What are some misconceptions about head lice? 1: Head lice cannot hop, jump, or fly. But they sure can crawl fast! 2: Pets and other animals do not catch, have, or spread head lice. 3: Personal hygiene and cleanliness (or lack thereof) at home or school has nothing to do with whether or not a person will get head lice. In fact, clean hair is preferred by the lice. 4: Head lice are not particular to one season. Infestations are year-round. 5: Head lice are not particular to one economic segment of society. They cross the lines of every income group. What is the difference between head lice and dandruff? The main difference between lice eggs (or nits) and dandruff is that lice eggs are firmly glued to the hair shaft; they are tightly stuck to the hair, and will not slide down the hair shaft under your fingertips. Nits are typically dark brown in color, especially when they are new and viable, not white as many people believe. Dandruff will either flake off, or slide on the hair underneath your fingertips. What does the AirAllé machine do? The AirAllé Machine uses controlled, warmed air to kill 99.2% of lice eggs in a single, 30 minute ‘green’ treatment. What does an AirAllé treatment feel like? Most people describe the AirAllé treatment like a warm head massage! It is quiet, easy to use, and very kid friendly. How effective is the AirAllé treatment? The AirAllé is an FDA-cleared medical device, and has thus been clinically tested and proven incredibly effective, particularly against the nits. Is the AirAllé machine safe? The AirAllé Head Lice Treatment Device is classified by the FDA as a level-one medical device, which means it is inherently low-risk. It is just air! AirAllé treatments are being done worldwide every day! Why doesn’t any one else offer the AirAllé treatment in this area? Fresh Heads owns the rights to the AirAllé treatment. Our competitors cannot offer it. Contact us and get the help you deserve!